Whether you’re going on an adrenaline charged snowboarding experience with friends, or planning your first winter holiday abroad, you can’t afford to hit the slopes unprepared. Statistics show that one in four Brits will suffer injuries on skiing holidays with 92% of those people then unable to ski for the rest of their holiday. More than a third ended up in hospital or having to fly home, so it makes sense to invest a little time and money beforehand to make sure you don’t burn out or potentially do long-term damage to your body. It’s common for new skiers & snowboarders to push themselves too hard early on which not only lowers your confidence and slows your overall progress, but can also result in serious injury. Over 15% of skiers admitted that a lack of experience, practice or training caused their accident to happen with nearly one in four skiers (23%) ending up with a broken bone or fracture and over a third (34%) of accidents resulting in serious sprains. Snowsports exercise nearly all the muscles in your body including your heart and lungs so to prepare, do regular cardio workouts 3 to 5 times a week. This could be walking, running, swimming or cycling alongside strength building exercises like squats, lunges, box jumps and planks to improve your core and posture and counter the effects of being at altitude. Remember to stretch afterwards to prevent shortening of the muscles, taking part in Yoga or Pilates will also improve your flexibility which in turn will help prevent injuries. One of the best ways to speed up the process is to visit one of Snozone’s indoor real snow centres before you go. 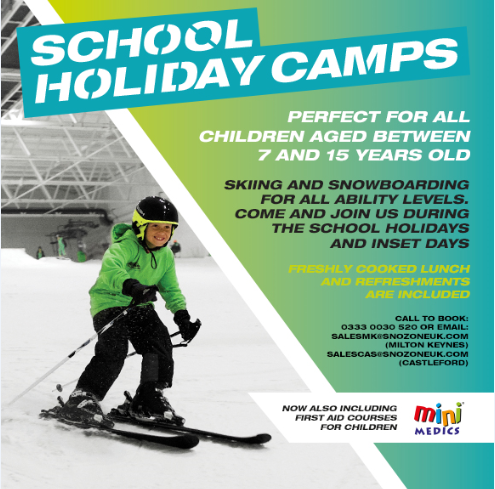 Research has shown more and more people are now using indoor real snow slopes to prepare for their upcoming holidays due to the excellent facilities, snow conditions and teaching now on offer in the UK. It can also help to reduce the costs of the holiday as less instruction is needed while away, so book a day-long course or a programme of lessons if you can. Even if you are not lucky enough to be going on a snowsports trip this winter, any exercise during the winter months is great for both your physical and mental wellbeing as it releases endorphins which give you the happy hormones to help you through the sunshine lacking winter months. It is very important to maintain your mental health and nothing is better than regular exercise alongside eating healthily and looking after yourself. Activities at Snozone are available to book on our website and pre-booking is strongly advised. For more details please visit Snozone or call 0333 0030 520.